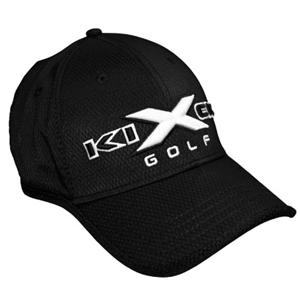 Stylish design and ultimate comfort make the KICK X GOLF(R) branded headwear the only choice for looking and feeling great on and off the course! 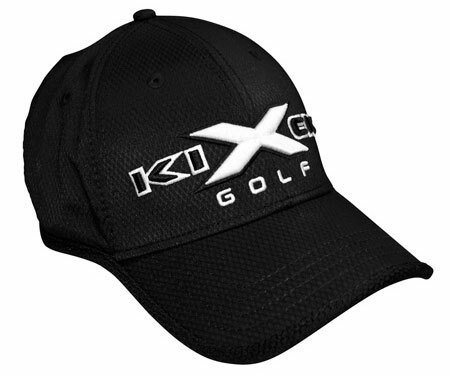 The KICK X GOLF(R) logo-embroidered hat offers unmatched fabric performance with breathability and comfort features, all designed to help you look and play your best. Raised, high stitch embroidered KICK X GOLF(R) Logo adorns front panel with rear closure GSC signage embroidery. Features re-enforced double stitch performance fabric construction offering maximum breathability and moisture wicking properties for long-lasting comfort and durability. These stylish ballcaps are now available in one adjustable size. Structured build features a breathable high-performance moisture-wicking fabric for the ultimate in comfort and fit. Comfort tapped internal seams, sport, full-color logo imprinting for added style and appeal. Double stitched construction for maximum durability. Soft, inner sweat-band and banding provide the perfect "fit" & "feel" for long-lasting comfort. Kick X Golf(R) raised logo embroidery across front panel, rear GSC logo closure embroidery.